Summer festivals are an important tradition in Belgium: music, friends, watered-down beer and fries every day, what’s not to love? Oh, that’s right. *Dramatic music* Camping. Camping is fun, cheap and practical, it’s just not such a great way to get some decent sleep (especially if you go to bed at 4 a.m. with a belly full of alcohol and junk food). Luckily, there’s new hope! 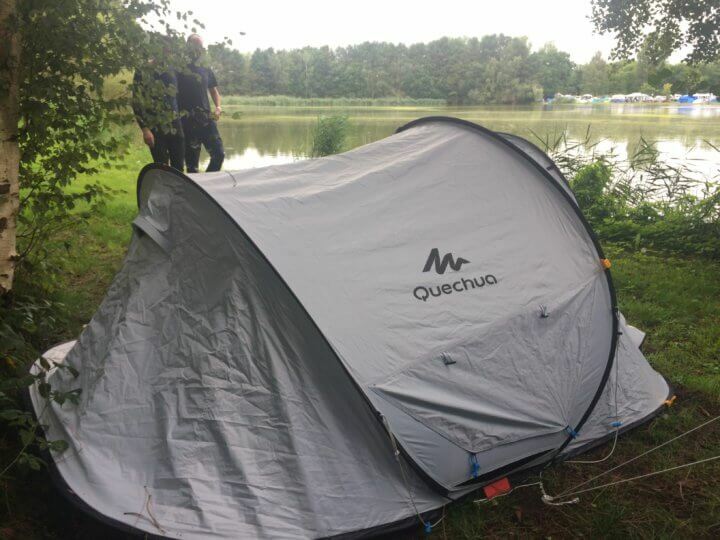 *Star Wars Music* Quechua’s Fresh & Black tent to the rescue! Decathlon’s genius invention features a reflective outer layer, and a pitch black inner layer that promises to keep the inside of the tent, well, Fresh & Black. Our own two volunteers Marie and Nadia accepted the risky mission to put it to the test in the most extreme conditions: camping at the festivals of Dour and Pukkelpop! Like any other 2” tent, it’s incredibly easy to set up. It literally takes 2 seconds: open the sleeve, let it pop out and your palace in the wild is ready! What’s in a name? Waking up (with or without hangover) is bliss in this one! Thanks to the reflecting exterior, your tent stays cool and so do you. The ultra black lining offers you the luxury to sleep in as long as you want (if you have loud neighbours, bring a pair of ear plugs to complete the magic combo). Ask Nadia how she spent 4 days at Dour and slept 10 hours a day (yep, fo real) on average. She won’t shut up about it. This one’s super easy to transport: in the shuttle, on the train, in the car, during the long walk to the campgrounds – you get it. Marie dared to carry it while riding her bike and she slayed all the way! This might not be in the official product description, but we found out the Quechua Fresh & Black tent is also great for taking (dark-mysterious-flattering for day 3) selfies!